You can't beat the price of cheap American ramen. This particular pack cost me 12 cents at Ralph's. At first, I thought that Maruchan had put a picture of a raw egg yolk on the front of their package. Upon closer inspection, however, it actually looks like some kind of pickled radish. 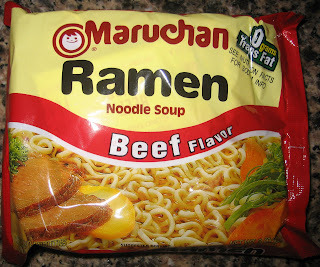 Most Americans are familiar with the Maruchan brand. It tends to show up in vending machines due to the convenience of their Instant Lunch line and low cost. When I ate these noodles, I was disappointed by the poor quality in the noodles themselves. They tasted mealy and lacked the springiness and crunchiness that is usually present in instant noodles. They were limp and heavy and had very little flavor. The broth in these noodles was decent. It tasted like a beef and onion broth. However, I couldn't get around the fact that the noodles themselves were so low quality. 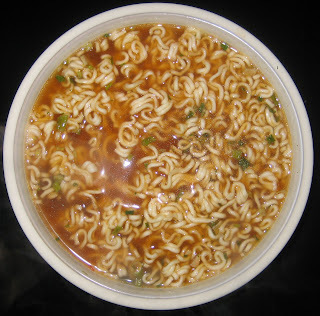 I recommend to pay a little bit more and get better quality instant noodles. These noodles are completely different than the ones found in the Instant Lunch cups and I actually prefer the Instant Lunch noodles to these. Seafood-flavored instant noodles are notorious for being disgusting due to overwhelming seafood flavor. 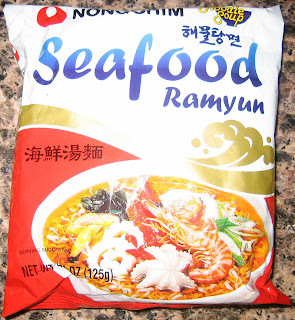 However, since seafood broths are such an important part of Korean, Japanese, Chinese, and Taiwanese cuisine, the seafood-flavored instant noodles are an essential part of a ramen manufacturer's lineup. The noodle brick came in the convenient circular shape. Inconveniently, however, the noodles had been broken into a few pieces during transit. My first thought upon sipping the broth was that these noodles did not really taste like seafood at all. Instead, the spiciness was quite powerful and overwhelmed the seafood taste at first. This is a pretty common seafood strategy among Korean noodle-makers since most of the seafood noodle soups in Korean cuisine are quite spicy anyway. After a few more sips, I started to taste the seafood identity of this broth. It was just a basic fish flavor but went quite well with the noodles. I probably wouldn't get these noodles again because I prefer the basic "hot and spicy" flavor without the seafood taste. There is nothing wrong with the seafood flavor here, it just seems a little unnecessary to me. To be honest, I'm not sure what Mupama means. I think it is some sort of beef and radish broth, but I have never had it at a Korean restaurant or noodle stand. I am generally quite satisfied with Nong Shim's products, so I figured I would give this a shot despite not really knowing what to expect. 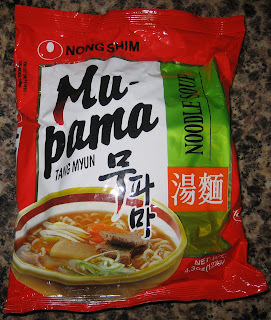 The flavor of the broth in the Mu-Pama Tang Myun was quite good. There flavor was primarily beef and scallion which always makes for a nice soup base. There was also a few pieces of dehydrated cabbage, which is unusual but enjoyable. The noodles were thick and chewy with plenty of weight and substance. Overall, I enjoyed these noodles despite not knowing what dish they were meant to evoke. The broth is a bit spicy, which was a nice surprise. 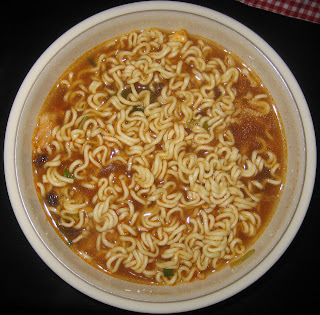 But it's nowhere near the spiciness level of some of the instant noodles that I have been profiling recently. I would recommend trying this one out if you happen to see it, but I know that it is quite rare to find in the US. 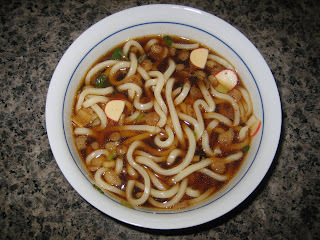 Udon noodle soup is one of my favorite fresh dishes, but instant versions of udon have usually sorely disappointed me. I understand the difficulty in manufacturing a noodle that can have 12 months of shelf life, yet reconstitute into the billowy soft noodle that udon requires. I was very interested to see how well Nong Shim could do, since their other offerings are mostly top-notch. The noodles came in a vacuum-sealed package and seemed to be partially dehydrated. They were certainly not dry and rock hard like the typical ramen package, but they were still much stiffer and drier than udon noodles should be. The thickness of each noodle seemed right, unlike Samyang's halfhearted attempt at udon where they just used their regular instant noodle. Upon tasting the broth and noodles, I almost had to throw this one in the garbage. The noodles are not soft at all and remain stiff with a strong wheat flavor. The texture on each one is grainy like a ramen noodle, not silky smooth like udon should be. In addition, the broth tasted like soy sauce rather than the delicious umami-loaded seaweed broth that udon should have. 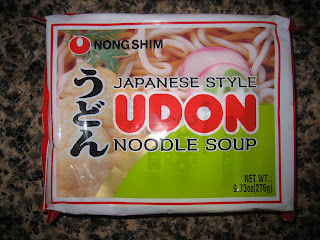 I really don't think it is possible with today's technology to make an instant udon noodle soup with a long shelf life. The udon noodles are just too delicate to stand up to the partial or full dehydrating that long shelf life requires. I would recommend going with a fresh udon package instead. 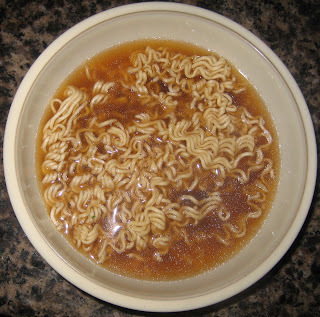 Another option is to buy fresh udon noodles from your local Asian grocer and then making your own broth from scratch or buying a udon broth base. I have tried both of those options and they have both come out vastly superior to the Nong Shim Udon noodles.